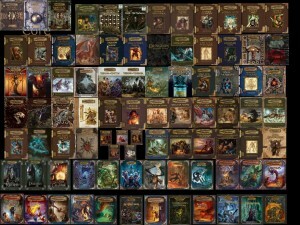 There are a lot of 3.5 books. When I decided to begin my campaign, I had very little experience with RPGs, as previously discussed. 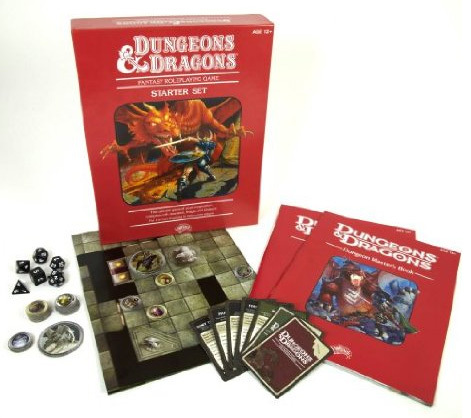 The only game I had played for any length of time used the D&D 3.5 system. There is a lot of things that 3.5 does great but, and this was a huge but to me, it is very complex. Having played games in that system I felt like I wanted my game to be similar but I did not feel like I could get a firm enough grasp on everything in the 3.5 system. Too many books and Dragon magazines and Errata for me to wrap my head around in a short period of time. So I extended my search outward. The first, and as it turned out last, place I looked towards was the newest D&D system. I had read things about 4th Edition D&D and parts of it seemed like they would be great. Simplified was the word I kept seeing thrown around, usually in a derogatory manner. Yet simple was what I wanted. I needed to master all the rules in a short time so an edition that had been out for less time seemed like a great solution. Unfortunately, I discovered that 4th ed. had become filled with enough books, errata, etc. that there was little difference in choosing it over 3.5. Luckily Wizards had another idea towards the end of 4th ed. that allowed me to construct my game: Essentials. I know, I know. Its D&D Lite, Kiddie D&D, and whatever else has been said about Essentials but it is a real blessing for new GMs. There are a bare handful of books that I had to read: The Dungeon Master’s Guide, The Heroes books, and the Monster Vault. It even had a true beginners guide in the Red Box set with a full adventure to start with if I wanted it. There are a variety of choices for players without it being completely overwhelming either to them or the GM who must keep track of what their players can do. The default setting, the Nentir Vale, is well developed and if one uses the Threats to the Nentir Vale Monster Vault it is practically a sandbox ready to go. There was even online support in D&D Insider which provided invaluable support for managing characters and designing new monsters. I was very excited when I started to read all of this and realized that instead of preparing for months on end, I could be ready to go in weeks. It all seemed perfect so I went ahead and made Essentials my system. I still consider this to be the right choice but having worked with Essentials for months now, I do see some of the limitations. The lack of options is great when you are starting out as a GM since it is harder to be overwhelmed but some players may feel stifled, especially if they are used to other systems. It is important to take your players into consideration when picking your system, since not everyone will be on board with your chosen system. I had toyed with the idea of Gamma World, a post apocalyptic system, or one of the Star Wars or superhero systems as they are all passions of mine but knowing my players, they would have preferred a fantasy setting. Some of my players are not all that happy with Essentials, particularly those who have spent a lot of time in 3.5 and feel like they can’t do everything they want with their characters. It is impossible to please everyone, all of the time so the best that we as GMs can do is to keep our players interested and engaged with our games. So there is why I picked Essentials as my system of choice, at least for now. What was your first system and why did you pick it?